I have written several recent essays in which I have suggested the potential feasibility and desirability of combining doctrines from Austrian Economics and Objectivism in our efforts to develop the strongest possible conceptual and moral case for a free market society. (1) In these essays I argued that Austrian Economics and Objectivism can benefit from each other’s insights and that the two schools have more in common than heretofore has been appreciated. (2) My conclusion was that it may be desirable to extract, refine, extend, and fuse together the following components taken primarily from these two schools of thought: (1) an objective, realistic, natural-law-oriented metaphysics as exemplified in the works of Aristotle, Carl Menger, Ayn Rand, and in the more recent works of Murray Rothbard; (2) Ayn Rand’s epistemology which describes concepts or essences as epistemological rather than as metaphysical; (3) a biocentric theory of value as appears in the writings of Menger and Rand; (4) Misesian praxeology as a tool for understanding how people cooperate and compete and for deducing universal principles of economics; and (5) an ethic of human flourishing based on reason, free will, and individuality as suggested in the contemporary works of Tibor Machan, Douglas B. Rasmussen, Douglas J. Den Uyl, and others. The purpose of this essay is to provide a clear, consistent, and accessible summary and introduction to the basic ideas contained in these earlier efforts. To help in this endeavor, I have included an exhibit providing a simplified example model or diagram of a potential Austrian-Objectivist philosophical foundation and edifice for a free society. This diagram focuses on pertinent factors, relationships, and general principles that define the proposed paradigm. In developing a conceptual framework for capitalism, it is necessary to focus our attention on the enduring characteristics of reality. Men live in a universe with a definite nature and exist within nature as part of the natural order. Using their minds, men have the ability to discover the permanent features of the world. A unified theoretical perspective and potent intellectual framework for analyzing the social order must be based on the constraining realities of the human condition. Reality is not optional. The Aristotelian, Mengerian, and Randian perspective is that reality is objective. There is a world of objective reality that exists independent of human beings and that has a determinate nature that is knowable. It follows that natural law is objective because it is inherent in the nature of the entity to which it relates. The content of natural law which derives from the nature of man and the world is accessible to human reason. Principles that supply a systematic level of understanding must be based on the facts of reality. In other words, the principles of a true conceptual framework must connect with reality. The only way to successfully defend principles and propositions is to show that they have a firm base or foundation. To properly construct a paradigm for a free society it is necessary to go back to absolute fundamentals in human nature. We need to have a precise understanding of the nature of the human person. Human beings are a distinct species in a natural world whose lives are governed by means of each person’s free will and individual conceptual consciousness. Unlike other beings, a person’s survival and flourishing depends on cognition at a conceptual level. People are all of one species with a definite nature and are uniquely configured because of their individuating features. There is a biological case for human diversity with the individual as the primary reality. We must respect the condition of human diversity and the fact that people are not interchangeable. Individuality is vital to one’s nature. A person is responsible for achieving and sustaining the human life that is his own. Each person has potentialities, is the steward of his own time, talents, and energies, and is responsible for becoming the person he has the potential to become by means of his own choices and actions. Human beings alone in the world possess a stable nature with certain definite, definable, and delimitable characteristics. Consciousness and free will are essential attributes of man’s nature. Reason is man’s guiding force. Human activities are self-conscious, purposeful, and deliberately chosen. One’s actions are caused by one's own volition which is a capacity of human nature. A human being can initiate and make choices about what he will do. Human action involves purposeful, intentional, and normative behavior. Mental action or thinking is the ultimate free action, is primary, and includes the direct willing of the person. Behavior thus takes place after a judgment or conceptualization has been made. It follows that there is a moral element or feature of action because human beings possess free will which can cause most (or at least some) of what they do. The natural law insists that everything stands under the test of reason grounded in reality. The particular nature of entities requires particular actions if the desired ends are to be attained. Natural laws of human action, discoverable through the use of reason, necessitate specific means and arrangements to affect the desired ends. The laws of nature determine the consequences. The free society works because it is in accord with nature. Natural law provides for reasoning and verification about what is good and what is not good. Natural law provides a criterion by which positive laws are judged. Natural law underpins the inalienable rights of life, liberty, and the pursuit of happiness. Negative liberty, the absence of constraints and restraints imposed upon a person by other persons, can be arrived at by studying the distinctive faculties and abilities of human beings and abstracting away the particular levels or amounts that specific individuals possess with respect to their faculties and abilities. What remains is the ability of each man to think his own thoughts and control his own energies in his attempts to act according to those thoughts. Negative freedom is thus a natural requirement of human existence. Freedom from man-made constraints and obstacles is a necessary condition to fulfill the potentialities of one’s nature. This does not mean freedom from obstacles in general. Not having the abilities or resources is not coercion and therefore does not constitute a lack of freedom. According to the precepts of natural law, a person should not be forced into acting or using his resources in a way in which he has not given his voluntary consent. It follows that man has certain natural rights to life, to the use of one’s faculties as one wills for one’s own ends, and to the fruits of one’s labor. These rights inhere in man’s nature and predate government, constitutions, and courts. Natural rights are derived from the facts of human nature and are respected because they are promotive of individuals’ well-being. Government is needed in order to enable people to live well in society. It is needed only to prohibit and punish the private violation of the natural rights of those who peacefully use their energies and resources, to punish fraud and deception, and to settle disputes that may arise. What is known (i.e., the object) is distinct from, and independent of, the knower (i.e., the subject). Knowledge is gained via various processes of integration and differentiation from perceptual data. For example, a person apprehends that he has a conscious mind by distinguishing between external objects and events and the workings of his mind. Self-awareness is thus attained when a person reflects upon what he has observed. Reality is what there is to be perceived. Reality exists independently of a man’s consciousness. It exists apart from the knower. It follows that empirical knowledge is acquired through observational experience of external reality. People can observe goal-directed actions from the outside. An individual attains an understanding of causality and other categories of action by observing the actions of others to reach goals. He also learns about causality by means of his own acting and his observation of the outcomes. Action is thus a man’s conscious adjustment to the state of the world. Introspection is a reasonably reliable but ancillary source of evidence and knowledge with respect to what it means to be a rational, purposeful, volitional, and acting human being. Each person knows universally from introspection that he chooses. In other words, observation is introspective in the case of free will. Universal inner or reflective experience is an important adjunct to external, empirical, physical experience. To survive and flourish a man must grasp reality. To do this requires a rational epistemology and an objective theory of concepts. These have been supplied by Ayn Rand. A person needs to observe reality, abstract essentials, and form objective concepts and laws. The objective nature of the world circumscribes the operations that must be accomplished if goals and values are to be attained. Reality is what is there to be perceived and studied. Everyone is constrained by what is metaphysically real. Fortunately, people have the capacity to objectively apprehend reality. A man’s mind can identify, but cannot create, reality. Knowability of the world is a natural condition common both to the external world and the human mind. Logic is pivotal to correct human thought because reality corresponds to the principles of logic. Men are capable of comprehending the workings of the world through the application of logic. Logic is the method by which a volitional consciousness conforms to reality. It is reason’s method. The method of logic reflects the nature and needs of man’s consciousness and the facts of external reality. Moral values enter the world with human life. There is a close connection between an objective normative structure for understanding human life and economics. Human flourishing or happiness is the standard underpinning the assessment that a goal is rational and should be pursued. This common human benchmark implies a framework for evaluating a person’s decisions and actions. It follows that the fundamental ethical task for each man is the fullest development of himself as a human being and as the individual that he is. Human life thus provides the foundation and context of the realm of ethics. The idea of value is at the root of ethics. A man’s immediate needs for survival are economic and are values for his life. Economic production is necessary to satisfy these needs or material values. A productive man is a rational, self-interested and virtuous man. He is doing what he ought to do to sustain his life. An Aristotelian self-perfectionist approach to ethics can be shown to support the natural right to liberty which itself provides a solid foundation for a minimal state. This approach gives liberty moral significance by illustrating how the natural right to liberty is a social and political condition necessary for the possibility of human flourishing—the ultimate moral standard in Aristotelian ethics interpreted as a natural-end ethics. A foundation is thus provided for a classical liberal political theory within the Aristotelian tradition. Human flourishing (also known as personal flourishing) involves the rational use of one’s individual human potentialities, including talents, abilities, and virtues in the pursuit of one's freely and rationally chosen values and goals. An action is considered to be proper if it leads to the flourishing of the person performing the action. Human flourishing is, at the same time, a moral accomplishment and a fulfillment of human capacities, and it is one through being the other. Self-actualization is moral growth and vice-versa. Not an abstraction, human flourishing is real and highly personal (i.e., agent relative) by nature, consists in the fulfillment of both a man’s human nature and his unique potentialities, and is concerned with choices and actions that necessarily deal with the particular and the contingent. One man’s self-realization is not the same as another’s. What is called for in terms of concrete actions such as choice of career, education, friends, home, and others, varies from person to person. Human flourishing becomes an actuality when one uses his practical reason to consider his unique needs, circumstances, capacities, and so on, to determine which concrete instantiations of human values and virtues will comprise his well-being. The idea of human flourishing is inclusive and can encompass a wide variety of constitutive ends such as knowledge, the development of character traits, productive work, religious pursuits, community building, love, charitable activities, allegiance to persons and causes, self-efficacy, material well-being, pleasurable sensations, etc. Self-direction (i.e., autonomy) involves the use of one’s reason and is central and necessary for the possibility of attaining human flourishing, self-esteem, and happiness. It is the only characteristic of flourishing that is both common to all acts of self-actualization and particular to each. Freedom in decision making and behavior is a necessary operating condition for the pursuit and achievement of human flourishing. Respect for individual autonomy is required because autonomy is essential to human flourishing. This logically leads to the endorsement of the right of personal direction of one’s life, including the use of one's endowments, capacities, and energies. These natural (i.e., negative) rights are metanormative principles concerned with protecting the self-directedness of individuals thus ensuring the freedom through which individuals can pursue their flourishing. The goal of the right to liberty is to secure the possibility of human flourishing by protecting the possibility of self-directedness. This is done by preventing encroachments upon the conditions under which human flourishing can occur. Natural rights impose a negative obligation—the obligation not to interfere with one’s liberty. Natural rights, therefore, require a legal system that provides the necessary conditions for the possibility that individuals might self-actualize. It follows that the proper role of the government is to protect man’s natural rights through the use of force, but only in response, and only against those who initiate its use. In order to provide the maximum self-determination for each person, the state should be limited to maintaining justice, police, and defense, and to protecting life, liberty, and property. Menger and Rand agree that the ultimate standard of value is the life of the valuer. Human beings have needs and wants embedded in their nature. Both Menger and Rand begin with the ultimate value of human life and determine the values that a man needs. Their respective objective approaches to value hold that value is only meaningful in relationship to some valuing consciousness. A value must be a value to an existing human being. The differences between the ideas of Menger and Rand on value are that Menger was exclusively concerned with economic value whereas Rand was interested in values of all types. For Rand, all human values are moral values that are essential to the ethical standard of human nature in general and the particular human life of who the agent is. Menger’s rational egoism recognizes that value is grounded in human needs and their satisfaction. Finding a basis for economics in biology, Menger states that man’s needs are not arbitrary and must be met if he is to survive and prosper. The satisfaction of human needs is the final cause in Menger’s theory and the driving force of all economic activity. Human needs are the beginning and the end of human activity because nothing would take place without the requirements of satisfying them. Menger explains that man is the ultimate cause as well as the ultimate end in the process of want satisfaction. Menger explains that value is a judgment made by economizing individuals regarding the importance of particular goods for maintaining their lives and well-being. A person assigns value to a good based on the end it enables him to achieve. Applying the concept of intentionality to economic value, Menger stressed that only individuals value and act. His value theory incorporates an analysis of natural human behavior. His theory focuses on individual action itself, rather than on the social phenomena that develop out of individual action. A value must require action in order to be reached. Value in every case is a function of valuing acts of an individual given his own particular context. Individual judgments are acts of preference or evaluation. Value must be in a man’s mind but also must be based in reality. While Menger recognizes that value does not exist outside the consciousness of a human being, he also does not disregard the realm of external reality. For value to exist, consciousness must recognize a connection between means and an end in reality. A value must be to a particular valuer in his unique and specific context for an end to which the value is a means. A person’s life is seen by Menger as the ultimate end of valuation and action. Life requires action and is an end in itself – an end which is not a means to any further end. Men must act to reach values in order to survive. Menger explains that objective value originates in a relationship between a man’s consciousness (i.e., reason) and his survival requirements. To have an objective value a man’s mind must grasp the relationship between the facts of existence and his life. He points out very clearly that a person can be mistaken with respect to their judgments of economic value. Consciousness can be wrong regarding what a man’s authentic needs really are, the actual relative importance of his needs, and the products or services that truly seem to meet his needs. Menger also states that it is only the evaluating subject who can make the determination that his judgment was wrong. Some of Menger’s propostions and concepts are incompatible with Mises’ brand of subjectivism. Mises did not believe that Menger really meant what he asserted about objective wants corresponding to an objective state of affairs. In other words, Mises thinks Menger actually meant values that are purely subjective. Mises is an absolute subjectivist who contends that all values emanate from the consciousness of the valuer. Mises uses the term “value” in a completely nonnormative, nonphilosophical manner. He insists that economic theory does not incorporate any idea of a correct preferential ordering among goods and services. His subjectivism emphasizes the private personal character of preferences, costs, and benefits. Mises’ praxeology does not pass judgment on action. It simply explains market phenomena on the basis of a given action and not on the basis of right action. For Mises, to state that an object has value is merely to state that it is the goal of a personally chosen course of action. The Misesian sense of value is purely formal and indicates nothing about whether or not an end (i.e., a value) is in fact valuable. Values are embedded deeply in personal, subjective acts of valuation and depend upon the personal assessment and reaction of an individual to the choices available. For Mises, an economist deals with subjective factors in the form of the meanings of events and objects for individuals. Economic events are thus the outcomes of valuations. Misesian economic science is therefore free from the value judgments of an economist who must take the value judgments found in the marketplace as his given data. An economist, in his role as economist, does not approve of or denounce individuals’ ends. He does nothing more than ask if the means chosen are appropriate for their purposes. Men act and choose according to their hierarchy of values. The foundation upon which the hierarchy is based is irrelevant to Misesian praxeological economics. Rand explains that moral values are not subjective constructs nor intrinsic features of morality, but rather are objective. The good is neither an attribute of things in themselves nor of a person’s emotional state, but is an evaluation made of the facts of reality by man’s consciousness according to a rational standard of value. When one attributes moral value to something he must address the questions of “to whom” and “for what.” If something is a value, it must have a positive relationship to the end of a particular individual’s life. Value is a function of the interaction between what is deemed valuable and the person to whom it is valuable. Value is neither totally internal nor completely external but is a function of a specific connection between external objects and an individual’s ends. Rand states that values reflect facts as evaluated by persons with respect to the goal of living. Whether or not a given object is a value is dependent upon its relationship to the end of a person’s life. Life’s conditionality is the basis of moral value. The thing in question must have certain attributes in order to further an individual’s life, and the individual must seek his life, for that object to be valuable. The objectivity of value derives from the fact that particular kinds of action tend to promote human life. A specific object’s value is a function of the factual relation between the object and a particular person’s life. The valid attribution of value reflects a factual relationship. The preeminent theory within Austrian value theory is the Misesian subjectivist school. Mises maintained that it is by means of its subjectivism that praxeological economics develops into objective science. The praxeologist takes individual values as given and assumes that individuals have different motivations and prefer different things. The same economic phenomena means different things to different people. In fact, buying and selling takes place because people value things differently. The importance of goods is derived from the importance of the values they are intended to achieve. When a person values an object, this simply means that he imputes enough importance to it to be willing to start a chain of causation to change or maintain it, thus making it a thing of value. Misesian economics does not study what is in an object, as does the natural scientist, but rather, studies what is in the subject. On the other hand, Menger and Rand agree that the ultimate standard of value is the life of the valuer. Human beings have needs and wants embedded in their nature. Both Menger and Rand begin with the ultimate value of human life and determine the values that a man needs. Their respective objective approaches to value hold that value is only meaningful in relationship to some valuing consciousness. A value must be a value to an existing human being. The differences between the ideas of Menger and Rand on value is that Menger was exclusively concerned with economic value whereas Rand was interested in values of all types. For Rand, all human values are moral values that are essential to the ethical standard of human nature in general and the particular human life of who the agent is. Although Menger speaks of economic value while Rand is concerned with moral value, their ideas are essentially the same. Both view human life as the ultimate value. Their shared biocentric concept of value contends that every value serves biological needs. Value thus has its roots in the conditional nature of life. Life can perish. Objective values support man’s life and originate in a relationship between a man and his survival requirements. Menger was concerned with the many values the pursuit of which is mainly an economic matter. Because anything that satisfies a human need is a value, that which satisfies a man’s material needs for food, shelter, healthcare, wealth, production, and so forth, is deemed to be an economic value. People require a certain degree of prosperity with respect to their needs, desires, and wants. From Ayn Rand’s perspective, every human value is a moral value (including economic value) that is important to the ethical standard of man’s life qua man. Rand viewed virtually every human choice as a moral choice involving moral values. Both Rand and Menger espouse a kind of contextually–relational objectivism in their theories of value. Value is seen as a relational quality dependent on the subject, the object, and the context or situation involved. The subject, object, and the situation that combine them are the antecedents of value. Mises’ paradigm for our age, as detailed especially in his Human Action, grounds economics upon the action axiom which is the fundamental and universal truth that individual men exist and act by making purposive choices among alternatives. Upon this axiom, Mises deduces the entire systematic structure of economic theory. Mises’ advocacy of free markets and his opposition to statism stem from his analysis of the nature and consequences of freely acting individuals compared to the nature of government and the consequences brought about by government intervention. Praxeology is the general theoretical science of human action. Mises grounds economics upon the action axiom that states that men exist and act by making purposive choices. Misesian praxeology refers to the set of sciences that derive by logical inference exclusively from the axiom of human action. Economics is thus a division of praxeology and is made up of apodictically true statements that are not empirically testable. Praxeological laws are universal doctrines whose applicability is independent of any particular empirical circumstances. Praxeology is a unifying framework that unites all types of human decisions, actions, and interactions. For Mises, economic behavior is a special case of human action. He contends that it is through the analysis of the idea of action that the principles of economics can be deduced. 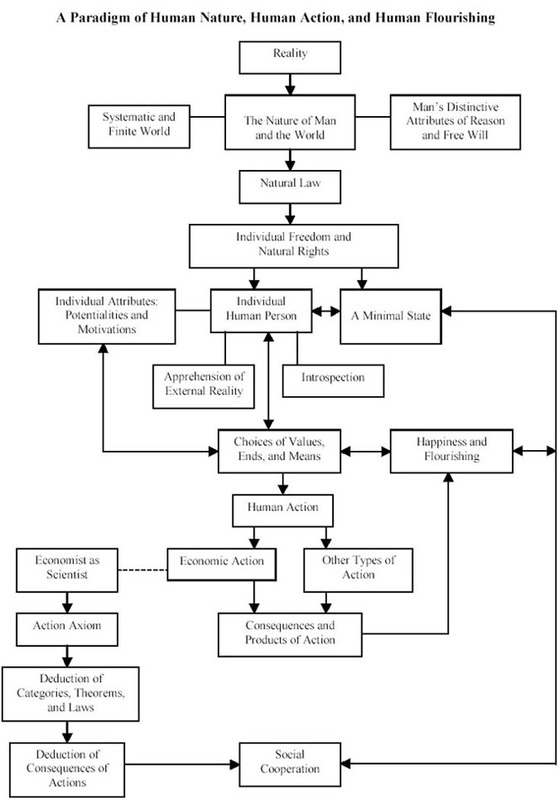 Economic theorems are seen as connected to the foundation of real human purposes. Economics is based on true and evident axioms, arrived at by introspection, into the essence of human action. From these axioms, Mises derives logical implications or the truths of economics. Through the use of abstract economic theorizing, Mises recognizes the nature and operation of human purposefulness and entrepreneurial resourcefulness and identifies the systematic tendencies that influence the market process. Mises’ insight was that economic reasoning has its basis in the understanding of the action axiom. He says that sound deductions from a priori axioms are apodictically true and cannot be empirically tested. Mises developed through deductive reasoning the chains of economic theory based on introspective understanding of what it means to be a rational, purposeful, and acting human being. The method of economics is deductive and its starting point is the concept of action. According to Mises, all of the categories, theorems, or laws of economics are implied in the action axiom. These include, but are not limited to: subjective value, causality, ends, means, preference, cost, profit and loss, opportunities, scarcity, choice, marginal utility, marginal costs, opportunity cost, time preference, originary interest, association, and so on. Mises maintains that all economic reasoning rests on (1) an understanding of the categories of human action and the meaning of a change taking place in phenomena such as knowledge, values, preferences, means, ends, costs, etc., and (2) the logical deduction of the consequences which would emerge from the accomplishment of some particular action or of the outcome which would arise from a specific action if the circumstances are altered in some specific way. As an adherent of Kantian epistemology, Mises states that the concept of action is a priori to all experience because it is part of the essential and necessary character of the logical structure of the human mind. Mises agrees with Kant that there is a group of common categories lodged in men’s minds through which they grasp that which exists. It is hard to see how Mises could contend that a priori knowledge of action is gained exclusively through introspection without any external observation. Perhaps it would have been better if he had said that economic theory is based in part on introspection. He could have argued that sense data alone could not reveal to a person the essential purposefulness of human action. The action axiom could then be depicted as derived form a combination of both external observation and introspection. Mises explains that a man’s introspective knowledge that he is conscious and acts is a fact of reality and is independent of external experience. Mises deduced the principles of economics and the complete structure of economic theory entirely through the analysis of the introspectively-derived a priori idea of human action. While it is certainly important to understand and acknowledge the useful role of introspection in one’s life, it is also necessary to realize that its role is limited, secondary, and adjunct to the empirical observation and logical analysis of empirical reality. It would have been better if Mises had said that external observation and introspection combine to reveal that people act and employ means to achieve ends. Introspection aids or supplements external observation and induction in disclosing to a man the fundamental purposefulness of human action. Many believe that Mises is on questionable grounds with his extreme aprioristic position with respect to epistemology. However, his praxeology does not inevitably require a neo – Kantian epistemology. It is not inextricably tied to an aprioristic foundation. Other epistemological frameworks may provide a better underpinning for free will and rationality. For example, Misesian praxeology could operate within an Aristotelian, Thomistic, Mengerian or Randian philosophical structure. The concept of action could be formally and inductively derived from perceptual data. Actions would be seen as performed by entities who act in accordance with their nature. Man’s distinctive mode of action involves rationality and free will. Men are thus rational beings with free will who have the ability to form their own purposes and aims. Human action also assumes an uncoerced human will and limited knowledge. All of the above can be seen as consistent with Mises’ praxeology. Once we arrive at the concept of human action, Mises’ deductive logical derivations can come with play. According to Mises, economics is a value-free science of means, rather than of ends, that describes but does not prescribe. However, although the world of praxeological economics, as a science, may be value-free, the human world is not value-free. Economics is the science of human action and human actions are inextricably connected with values and ethics. It follows that praxeological economics needs to be situated within the context of a normative framework. Praxeological economics does not conflict with a normative perspective on human life. Economics needs to be connected with a discipline that is concerned with ends such as the end of human flourishing. Praxeological economics can stay value-free if it is recognized that it is morally proper for people to take part in market and other voluntary transactions. Such a value-free science must be combined with an appropriate end. Economics, for Mises, is a value-free tool for objective and critical appraisal. Economic science differentiates between the objective, interpersonally valid conclusions of economic praxeology and the personal value judgments of the economist. Critical appraisal can be objective, value-free, and untainted by bias. It is important for economic science to be value-free and not be distorted by the value judgments or personal preferences of the economist. The credibility of economic science depends upon an impartial and dispassionate concern for truth. Value-freedom is a methodological device designed to separate and isolate an economist’s scientific work from the personal preferences of the given economic researcher. His goal is to maintain neutrality and objectivity with respect to the subjective values of others. Misesian economics focuses on the descriptive aspects of human action by offering reasoning about means and ends. The province of praxeological economics is the logical analysis of the success or failure of selected means to attain ends. Means only have value because, and to the degree that, their ends are valued. The reasons why an individual values what he values and the determination of whether or not his choices and actions are morally good or bad are certainly significant concerns but they are not the realm of the praxeological economist. The content of moral or ultimate ends is not the domain of the economist qua economist. There is another level of values that defines value in terms of right preferences. This more objectivist sphere of value defines value in terms of what an individual ought to prefer. Knowledge gained from praxeological economics is both value-free (i.e., value neutral) and value-relevant. Value-free knowledge supplied by economic science is value-relevant when it supplies information for rational discussions, deliberations, and determinations of the morally good. Economics is reconnected with philosophy, especially the branches of metaphysics and ethics, when the discussion is shifted to another sphere. It is fair to say that economic science exists because men have concluded that the objective knowledge provided by praxeological economics is valuable for the pursuit of both a person’s subjective and ultimate ends. Mises teaches that social cooperation is a more effective and efficient mean to attain one’s self-interest than is social conflict. Conflicts are naturally resolved through the division of labor and the substitution of economic competition for biological or Hobbesian competition. What makes friendly relations possible and preferable is the high productivity of the division of labor which eliminates conflicts of interest. Mises wanted men to have the chance to pursue their happiness successfully. That chance presupposes social cooperation, meaning a peaceful and secure society in which individuals can interact to their mutual benefits while seeking their own diverse projects, specializations, and forms of flourishing. Mises distinguishes between social cooperation based on freely-made contracts and social cooperation based on subordination. If social cooperation is voluntary it is contractual and if it is based on subordination and command it is hegemonic. Mises favors conctractual social cooperation because the maximization of individual free choice is a means to achieve greater prosperity for everyone in society. Any interference with the free market is interference with the freedom of human choice and action. Mises thus concludes that the free market and the social order based on it comprise the only viable system of social cooperation and division of labor. He argues that men’s potential for cooperation depends upon freedom, peace, private property, individual rights, limited government, and inequalities of wealth, income, talents, and natural resources. Mises explains that economic theory examines the efficiency and effectiveness of the means selected to attain chosen ends. Since action pursues definite chosen ends, it follows that there can be no other standard for evaluating actions but the desirability or undesirability of their effects. The given purpose of economics is to preserve the order of social cooperation and social harmony. This is done by deducing the outcomes of purposive actions undertaken within the framework of the division of labor. Actions, institutions, laws, and so on are correct if they sustain social cooperation which is a precondition of the happiness of individuals within society. In other words, social cooperation facilitates and contributes to human flourishing and happiness. Mises contends that economics is the foundation for politics even though economics itself is value – free and apolitical. He explains that the political doctrine of classical liberalism is a direct application of the scientific findings of economics. Mises’ case for classical liberalism is a utilitarian one because when an economist proclaims that a certain economic system or policy is bad he is saying that it is inappropriate to the desired goal. In assessing an economic doctrine, one only has to ask if it is logically coherent and if its practical application will enable people to attain their desired goals. Mises’ concern is with whether or not policies and institutions serve or undermine social cooperation and individuals’ happiness. He thus sees classical liberalism, a political doctrine, as an application of theories developed by praxeology and based on rational economics. According to Mises, classical liberalism is a coherent theory of man, society, and the institutional arrangements required to provide social harmony and cooperation. Knowledge of the consequences of alternative social arrangements is necessary and useful in deciding from among different social structures. The choice of the best model of political economy is a value-laden endeavor that is underpinned by the value-free logic of praxeological economics. Given the nature of a human being, it is only he who can decide, and has the right to decide, upon the relative importance of different values and whether or not to act upon them. Since a person has free will, he can choose to cause physical changes to occur without any prior physical causes. Values are metaphysically freely chosen and acted upon when there is an absence of coercion. Man’s distinctiveness from other living species is his ability to originate an act of his consciousness. This process of thought is originated volitionally. Freedom is the degree of independence of an individual’s plans from the plans of others. Freedom can be assessed by examining the autonomy a man would have under various social arrangements. Praxeological analysis reveals that a free market society results in the optimum amount of freedom, social cooperation, and social coordination. Mises views social cooperation and coordination as a proxy for happiness which is similar to the Aristotelian notion of human flourishing. He deduces that the coordination of different free and prudent actions leads to social coordination. It follows that virtuous and moral human actions based on freedom and singularity fosters the coordination process. Praxeological economics and the philosophy of human flourishing are complementary and compatible disciplines. Economics teaches us that social cooperation through the private property system and division of labor enables most individuals to prosper and to pursue their flourishing and happiness. In turn, the worldview of human flourishing informs men how to act. In making their life-affirming ethical and value-based judgments, men can refer to and employ the data of economic science. A conceptual and moral defense of a political and economic system must be grounded on the best reality-based ethical system that a reasoning individual can discover. A true paradigm or body of theoretical knowledge about reality must address a broad range of issues in metaphysics, epistemology, value theory, ethics, and so on in a systematic fashion. The concern of the system-builder is with truth as an integrated whole. Such a body of knowledge is circumscribed by the nature of facts in reality including their relationships and implications. When constructing a paradigm, it is legitimate to take a selective approach with respect to existing philosophical positions because a paradigm’s consistency with reality is all that really matters. It is thus appropriate for us to extract what is true and good from the writings of Mises, Menger, Rand, and others and use those components as a basis for a better integration that allows for a deeper understanding of what would constitute a morally right socioeconomic system. By integrating and synthesizing essential elements of the ideas of the Austrian School of Economics with those from Ayn Rand’s philosophy of Objectivism we can come closer to a comprehensive, logically consistent view of the world and a foundation and justification for laissez-faire capitalism. Austrian-Objectivism would be a systematic philosophy that includes a particular view of reality, human nature, human action, the nature of knowledge and the nature of value, and would include a specific code of morality based on the requirements of life in this world. The integration of the tradition of Austrian Economics and the philosophy of Objectivism would enhance both heritages and provide a more solid foundation and a more unified perspective with respect to understanding the nature and workings of the world. It is necessary to provide a realistic foundation for a true paradigm for a free society. Therefore, a comprehensive moral defense of individualism and its political implications is founded appropriately on a naturalistic philosophy. An Aristotelian metaphysics such as those supplied by Menger or Rand would be an excellent starting point for a political and economic framework based on the requirements of reality and of man’s nature. Menger, like Aristotle, claimed that essences exist within entities themselves. For naïve realists such as Menger and Aristotle, essences are embedded in concretes and are assumed to be self-evident. In other words, the mind would tend to be epistemologically passive in arriving at essences, universals, or concepts. Menger speaks in an Aristotelian sense when he explains his exact theory. Although Menger’s value theory was sound, the epistemology on which it rests is not as convincing as it could have been if he had recognized, as does Rand, that concepts or universals are epistemological rather than metaphysical. If an essence is metaphysical, a person would just look at an object and abstract or intuit the essence. Although most people would “get it” some would not and this would lead to skepticism. What Menger needed was to be able to validate his theory of concepts. To do this he would have had to view essences as epistemological and the mind as epistemologically active, but as metaphysically passive. Mental effort is required to form abstractions and to discover the nature of actualities that exist in the world. Remember, one’s theory of value is underpinned by his theory of concepts and if the latter is flawed then one can question the former. Mises treated the concept of action as a priori and self-evident and deduced all other concepts from it through logic alone. Epistemologically, the dependence on the a priori evidences the effort to avoid the induction of concepts from empirical observation. Mises’ declaration of the a priori negates the functions of a person’s cognition and evaluation of external reality. Mises failed to recognize that to defend concepts such as human nature, individual rights, and value requires the defense of abstractions which are products of a relation between a subject and an object. Concepts enable a person to organize his understanding of the world. Rand’s theories of concepts, values, and ethics accurately reflect a man’s epistemic nature. Objectivism endorses a theory of objective value and an ethics that reflects the primacy of existence. Because Rand identified and comprehended the epistemological nature of concepts and the nature of the concept of value itself, it is possible for us to understand them and to explain to others the logical steps that were included in their formulation. Ayn Rand’s conception of universals (or essences) as epistemological is arguably superior to the traditional interpretation given to the Aristotelian or Mengerian idea of universals as being metaphysical. Rand explains that knowledge is acquired by an active, conscious agent through the processes of induction and deduction. In order to deduce from axioms and general statements, we must first have inductive inferences. We can know via the senses, inferences from data supplied by the senses, and introspective understanding. Once it is acknowledged that Mises’ action axiom could be derived through an inductive process, it will then be legitimate to follow and adopt his logical arguments that all the core principles and relationships of economics can be deduced from that axiom. After the free market has been accepted as moral and politically legitimate, it is then appropriate for economists to derive praxeological laws. Objectivism’s Aristotelian perspective on the nature of man and the world and on the need to exercise one’s virtues can be viewed as synergic with the economic coordination and praxeology of Austrian Economics. Placing the economic realm within the general process of human action, which itself is part of human nature, enables theoretical progress in our search for the truth and in the construction of a systematic, logical, and consistent conceptual framework. The Objectivist worldview can provide a context to the economic insights of the Austrian economists. (4) Of course, any paradigm should be open to further intellectual investigations that may enrich it. There is always more to be learned about reality. An integration and combination of selected doctrines from the Austrian School of Economics (as exemplified in the writings of Mises and Menger) and from the Objectivist School can provide a philosophical basis for an appropriate moral and political structure for a free society. A naturalist metaethical perspective provides the foundation for the type of framework that is most supportive and accommodating of the moral nature of human life. Our goal is to have a paradigm or system in which the views of reality, knowledge, human nature, value, and society make up an integrated whole. The suggested synthesis of Austrian Economics and Objectivism can provide an excellent foundation for such a paradigm. Of course the paradigm will grow and evolve as scholars engage, question, critique, interpret, and extend its ideas. This systematic approach and/or its components have been studied by many modern-day thinkers. This is as it should be because our goal is to have a paradigm that accords with reality. As such, it must be viewed as a vibrant, living systematic framework that aims at the truth.